An independent online toy shop, passionate about play! 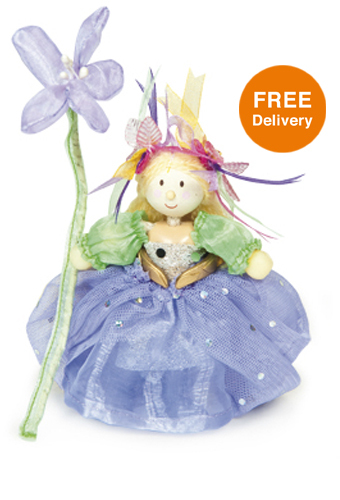 The Fairy Queen looks splendid in her beautiful sequin lilac dress with pale green sleeves and delicate head dress. With her magical flower wand, she watches over all the creatures of the fairy kingdom! Budkins are friendly wooden figures, perfect for little hands and big imaginations! Designed in the UK by Le Toy Van, these beautifully crafted, hand-painted wooden dolls are fully posable, hand-painted, and dressed in real fabric outfits, often with matching accessories. 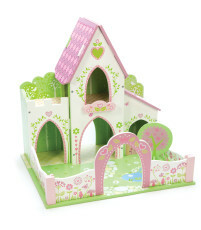 Budkins are perfect for pretend play and make an ideal gift for boys and girls. Manufactured overseas from responsibly sourced wood, products are produced under the strict control of the UK design and management teams, who ensure products adhere to the latest EU safety guidelines and are made in good working conditions.